The Files Go app users will now see a 'Share' tab for easier offline sharing. Google says that the offline data transfer speeds have also increased, up to 490Mbps. Google launched Android Go in December last year along with a number of other 'Go' branded apps. One of them was its storage management app, Files Go. While all the Go apps work with the lightweight version of Android, File Go is compatible with almost all Android devices. Now, the company has updated Files Go to version 1.0.201265789, and added a new 'Share' tab for easier file sharing. Not only that, Google has dramatically increased the offline file transfer speed as well. There are also some improvements to the connection protocol and it is said to take an average of five seconds for connecting two devices. Additionally, new security measures are added so that the connection is established with the right user and all transfers are encrypted. As per Google's blog post, users will now see a new 'Share' tab, which facilitates easier offline file sharing. The company says that the offline file transfer speeds have also increased substantially as users have observed transfer speeds of up to 490Mbps. 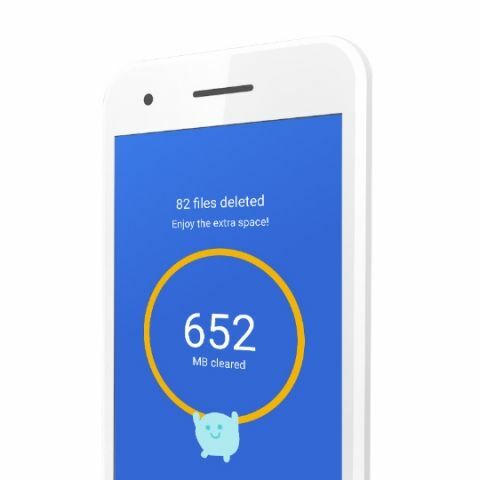 However, the Files Go app selects the fastest available method on a device for faster file sharing, such as 5GHz Wi-Fi Direct. This latest version of the app now supports file extraction and there's also a 'Clean' tab that will help users in deleting old videos. This is a big change in the UI as previously, the app had navigation tabs for files and storage. Launched in December in 2017, the app works on all phones running Android 5.0 (Lollipop) and higher. 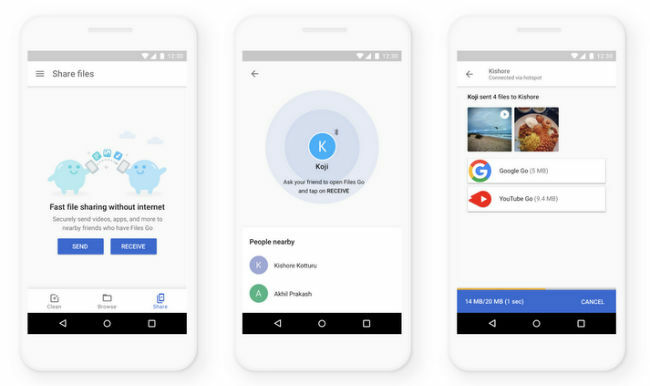 The lightweight data sharing app is aimed at helping users free up space in Android devices, and also allows for offline file sharing. Further, it makes searching for files easier, and backs up files to the cloud to save space on the device. In April this year, Google made the Files Go app available Odia. "Smartphone users with data storage capacity of as low as 4GB often struggle to keep on top of the storage space on their phones and are constantly having to choose between what to keep or delete," said Josh Woodword, Group Product Manager, Next Billion Users at Google. The app was launched with support for Indian languages, including Hindi, Bengali, Gujarati, Kannada, Marathi, Malayalam, Punjabi, Tamil, Telugu and Urdu. Google is also adding support for more Indian languages.